January 29, 2013 (Washington, D.C.): A distinguished group of fourteen retired generals and admirals, representing all branches of the United States Armed Forces, has signed a letter opposing the nomination of Sen. Chuck Hagel for Secretary of Defense. Sen. Hagel’s hostility towards Israel. Sen. Hagel has demonstrated an abiding hostility towards Israel, a view that would be detrimental to ournational defense and perhaps perilous to our only stable, reliable ally in the Middle East were he to become Secretary. Sen. Hagel’s outlook towards Iran. Sen. Hagel repeatedly opposed sanctions against Iran while serving in the Senate, and in 2006 stated that "a military strike against Iran, a military option, is not a viable, feasible, responsible option” – an ill-advised statement that undercuts the effectiveness of both diplomatic and military policies to prevent Iran from obtaining nuclear weapons capabilities. First, Sen. Hagel stated on 29 August, 2011: “The Defense Department, I think in many ways has been bloated…I think the Pentagon needs to be pared down.” This statement seems to ignore the fact that, the Budget Control Act of 2011 had already cut $487 billion from the defense budget over ten years -- let alone that this round of reductions comeson top of the more than $300 billion in cuts that took place under then-Secretary Robert Gates. Recall that Secretary Leon Panetta on 4 August, 2011 stated that hundreds of billions more in cuts over ten years that sequestration will bring about will be “disastrous to the defense budget.” JCS Chairman General Martin Dempsey has indicated that sequestration poses “very high risk” for national security. Consequently, Sen. Hagel’s assertion that still further cuts are warranted is at odds with the judgment of the Pentagon's current civilian and military leadership. It suggests a disqualifying lack of understanding of the dire effects such reductions would have on our defense capabilities. Third, Sen. Hagel has demonstrated an abiding hostility towards Israel, a view that would be detrimental to our national defense and perhaps perilous to our ally were he to become Secretary. For example: In 2009, he urged President Obama to undertake direct negotiations with Hamas. In October 2000, he was one of just three Senators to refuse to sign a letter expressing support for Israel during the second Palestinian intifada. In 2002, following several deadly Palestinian suicide-bombing attacks in Israel, he authored aWashington Post op-ed asserting that “Palestinian reformers cannot promote a democratic agenda for change while both the Israeli military occupation and settlement activity continue." Israel is our only stable, reliable ally in an increasingly turbulent and hostile Middle East. Given Sen. Hagel’s record of hostility towards the Jewish State, his confirmation could signal to Israel's enemies and ours that this important bilateral relationship is unraveling. That perception could invite aggression and perhaps another, otherwise avoidable regional war. Another matter of profound concern is Sen. Hagel’s outlook towards Iran -- a country that, among other acts of war against our country, employed its proxy, Hezbollah, to bomb the Marine barracks in Beirut in 1983, resulting in the deaths 241 American servicemen. 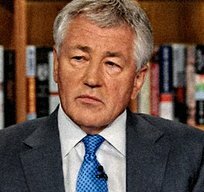 Sen. Hagel has repeatedly refused to support sanctions against Iran while in the Senate, and in 2006, he stated that "a military strike against Iran, a military option, is not a viable, feasible, responsible option.” This ill-advised statement telegraphs to Tehran that it should not fear a U.S. military response to the continued pursuit of Iranian nuclear weapons. Whichever policies are pursued with the objective of preventing a nuclear Iran can only have hope of success if backed by a credible military deterrent. It would be unwise to confirm a nominee for Secretary of Defense who has already publicly taken that option off the table. For all of these reasons, it is our professional assessment that confirmation of Sen. Hagel to be Secretary of Defense would be contrary to the United States' vital national security interests. Technorati Tag: Chuck Hagel and Obama.